At Radiatorsuk we provide a wealth of product information to our customers when selecting the right radiator to heat their environment but we also provide an aftercare service to help you take care of your new radiator to ensure maximum efficiency. As an essential part of your heating system, your radiators and all their connecting parts have to be regularly maintained in order for them to work correctly. It is therefore important to know what happens when they stop working and how to correct this. 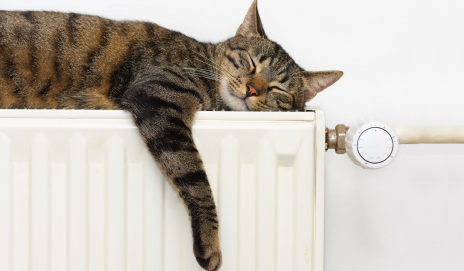 Trapped air keeps hot water from keeping your radiator fully heated; bleeding your radiators is a simple fix that you can do yourself, and it can make a big change to the energy efficiency of the heating of your home. The steps are not hard if you follow them exactly, so if you do not feel completely confident in what you are doing then we would advise you stop and seek help from a heating engineer with the proper qualifications. First turn your heating on and make sure your radiators get hot. You might have to turn the temperature up on your thermostat and/or individual radiator temperature controls to make sure that they come on. The aim of increasing the temperature is to build the pressure up inside the radiator so that you can force the air out. Next you need to find out which radiators need bleeding. Once all the radiators get hot you should check each individual one and see if every part of the radiator is warming up. Caution should be implemented; radiators can get very hot and you do not want to end up burning yourself. Cool spots that are mostly located toward the top of the radiator can mean that air is trapped and you will need to bleed that specific radiator. Before you bleed your radiators you should check and make sure that your central heating is turned off. This reverses the process that was identified in the first step, which allows you to handle the radiators and avoid burning yourself or even getting the floor soaked. A radiator key is usually required for bleeding radiators but modern radiators can require a flat head screw driver. Finding the radiator key is often the hardest part so keeping one near the boiler is probably a good idea. If not, you can buy a radiator key from any DIY or hardware store for a few Pounds. A valve is located at one end of the top of the radiator. The radiator key can be attached to the square piece in the centre, or you can put the end of the screw driver into the groove. Hold the key with a cloth or screw driver and have a separate cloth ready to catch any possible drips then turn the radiator key slowly and anti clockwise. You will hear a hissing sound if air is escaping. 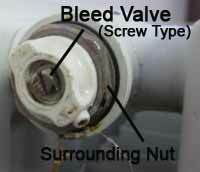 Liquid may come out of the valve if there is no more air, so be prepared to close the value quickly if it does. Liquid may come out like a jet and not a dribble if you have a modern screw driver operated escape valve. Next, you have to check the pressure by looking at the gauge on the boiler. If the pressure is very low you will need to top up by using the tap or lever on the boiler (also known as the filling loop). After this you should do another hot test to make sure that your efforts were successful. You can do this by turning your heater on and waiting for the radiators to heat up, and then you can check to see if there are any cool spots. Some modern radiators do come pre-installed with automated bleeding technology, eliminating the need to maintain this aspect of your heating system. Optionally, you can look to fit 'Auto Vents' to pre-existing instalations. Auto vents are automatic radiator bleeders that attach to the valves. The vent will let air out gradually which will increase the effectiveness of your radiator, also lowering the owrkload on your boiler and improving it's lifespan. Keep in mind that you will need one auto vent per radiator. You may also consider other radiator accessories to improve the aesthetic of your room. There are also further options for improving your heating systems efficiency. For example, radiator insulation is a simple way to make sure your radiators heat the room and not your walls. You need to make sure that the heat being generated in your home is not wasted by keeping your home properly insulated. This can be made a simple task if you simply check for draughts around your windows and doors. Draught proofing is mostly cheap and easy to do by self installation. Insulation foil behind the radiator reflects any heat that it generates back into the room. These are available in many hardware shops and you can install them yourself.